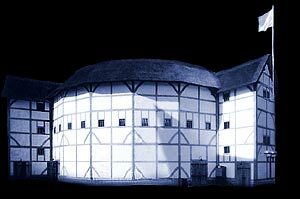 The outside picture of the New Globe Theatre immediately conveys everyone's perception of the architecture of Tudor & Elizabethan England. The black and white colouring in the distinct outer skin of the building cannot be mistaken for anything else (see Theater pictured at the top of the page). 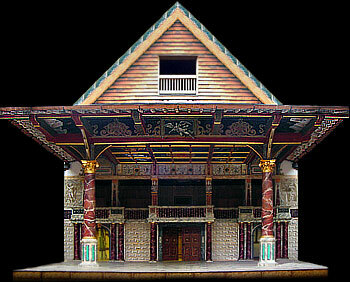 The new Globe Theatre creates an imposing picture which can be seen on land or from the River Thames. A wonderful addition to the architecture of London - an image of the past mingling with the modern architecture of the present. The thatched roof of the new Theater, another prominent feature of the picture was made in traditional style with Norfolk reeds. It has, however, been coated with a special fire-protective liquid. It is the first thatched roof building that has been allowed in London since the Great Fire in 1666. Not one inside picture of the old theater is in existence, however, a picture of another amphitheatre, the Swan, has survived. In 1596 a Dutch traveller and student called Johannes de Witt attended a play at the Swan Theatre in London. Whilst he was at Theatre de Witt made a sketch of the inside of the Swan. A friend of Johannes de Witt called Arend van Buchell copied the sketch and de Witt added this drawing to his diary. His diary note, together with the sketch, is probably the single most important source of information regarding the internal layout of London theatres and has no doubt helped with the reconstruction. Other important sources of information are the map views which illustrate a picture of London when the old Globe was still in existence. The picture of the map by Claes Van Visscher clearly shows the architecture and location of the old Theatre and its close proximity to the Bear Garden ( hence the name of the Bear Museum on the New Globe Theater complex). Other significant map views are the Hollar, the Agas and the Norden. The inside picture of the stage of New Theatre is as authentic as possible. Features of the picture are the two huge ' Herculean ' pillars. The original ' Herculean ' pillars were made of huge, single tree trunks which were drilled through the centre to eliminate warping of the wood. They were painted to give a marble appearance emulating the Roman and Greek classic styles, as has been emulated in the new Globe as you can see in the picture. The pillars support a roof called the ' Heavens '. The Heavens are painted with pictures of the sun, moon and the zodiac. Behind the pillars is the stage wall called the ' Frons Scenae ' (taken from the name given by Imperial Rome to the stage walls of their amphitheatres). A doorway to the left and right and a curtained central doorway from which the actors make their entrances. Above the door area is a highly decorative screen. The statues, or reliefs, which can be seen on the right and left of the picture of the stage represent Themes of Comedy and Tragedy.